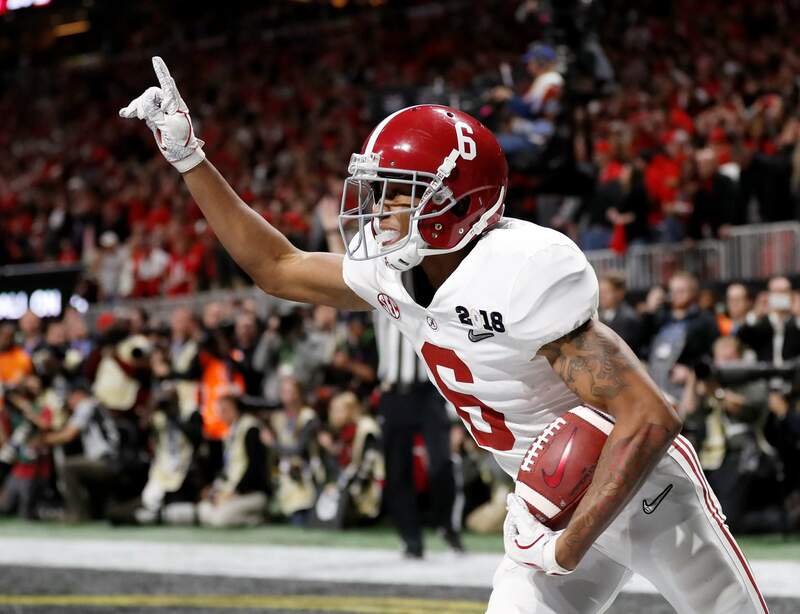 Alabama wide receiver DeVonta Smith (6) celebrates his touchdown during overtime of the NCAA college football playoff championship game against Georgia, in Atlanta. The AP preseason Top 25 is out, and for the third straight year Alabama is No. 1. The Crimson Tide is just the second team to be ranked No. 1 in the preseason Associated Press Top 25 poll for three consecutive seasons. Alabama received 42 out of 61 first-place votes. Ohio State – 105 weeks at No. 1Alabama – 104Oklahoma – 101Notre Dame – 98Southern California – 91Florida State – 72Nebraska – 70PRESEASON FAVORITESThis is Alabama’s seventh time overall being a preseason No. 1, matching USC for fourth most. Oklahoma – 10 preseason No. 1 rankingsOhio State – 8Alabama – 7USC – 7Florida State 6Nebraska – 6THE OTHER CHAMPSCentral Florida was the only team in the country to go undefeated last season and – you might have heard – the school decided to declare the Knights national champions because why not? This is college football and nobody is really in charge. UCF is ranked in the Top 25 for the first time to the start the season, coming in 21st in the preseason poll. The Knights are the highest-ranked team not in a Power Five conference, one spot ahead of Boise State from the Mountain West. If that ranking after going unbeaten seems unusually low, it is but it is not unprecedented. In the CFP/BCS era (1998-present), 19 teams have had unbeaten seasons. Three of those teams – 1998 Tulane, 1999 Marshall, 2004 Utah – were unranked in the preseason poll the next season. Not surprisingly, all those teams played outside of what were then called BCS automatic qualifying conferences. Five other teams were ranked outside the top 10, including three from outside BCS-auto bid leagues. Boise State in 2007 was No. 24 in the preseason. Utah in 2009 started 19th. TCU began 2011 at No. 14. The only so-called power conference team to go unbeaten in the BCS/CFP era and be ranked similarly low the next season was Auburn – twice. After going 13-0 in 2004, the Tigers started 2005 ranked 16th. After Cam Newton led Auburn to the 2010 national title, the Newton-less Tigers were ranked No. 23 to begin 2011. BUCKEYE QUESTIONSUrban Meyer’s uncertain status as Ohio State coach cost the Buckeyes some points in the AP poll, and probably at least one rankings spot.